Yeast SAR1 is an essential gene required for transport of secretory proteins from the endoplasmic reticulum to the Golgi apparatus. 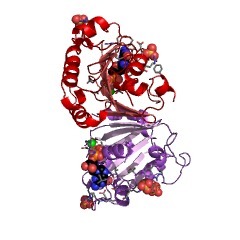 There are 1997 SAR domains in 1994 proteins in SMART's nrdb database. Taxonomic distribution of proteins containing SAR domain. This tree includes only several representative species. The complete taxonomic breakdown of all proteins with SAR domain is also avaliable. Click on the protein counts, or double click on taxonomic names to display all proteins containing SAR domain in the selected taxonomic class. 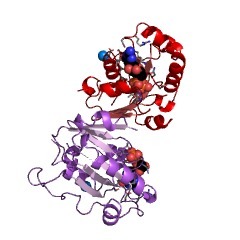 Two new members (Sar1a and Sar1b) of the SAR1 gene family have been identified in mammalian cells. 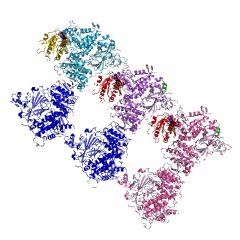 Using immunoelectron microscopy, Sar1 was found to be restricted to the transitional region where the protein was enriched 20-40-fold in vesicular carriers mediating ER to Golgi traffic. Biochemical analysis revealed that Sar1 was essential for an early step in vesicle budding. A Sar1-specific antibody potently inhibited export of vesicular stomatitis virus glycoprotein (VSV-G) from the ER in vitro. Consistent with the role of guanine nucleotide exchange in Sar1 function, a trans-dominant mutant (Sar1a[T39N]) with a preferential affinity for GDP also strongly inhibited vesicle budding from the ER. In contrast, Sar1 was not found to be required for the transport of VSV-G between sequential Golgi compartments, suggesting that components active in formation of vesicular carriers mediating ER to Golgi traffic may differ, at least in part, from those involved in intra-Golgi transport. The requirement for novel components at different stages of the secretory pathway may reflect the recently recognized differences in protein transport between the Golgi stacks as opposed to the selective sorting and concentration of protein during export from the ER. SAR1 encodes a 21-kDa GTPase, which is required for vesicle formation from the endoplasmic reticulum in yeast. 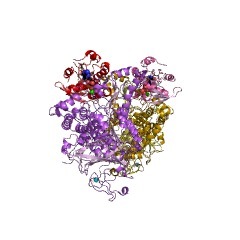 Although it belongs to the expanding small GTPase superfamily, there are interesting structural features that are unique to the Sar1 protein. We performed a site-directed mutational study to identify the amino acid residues that are essential for the Sar1p function. Among seven mutants we constructed, four are functionless by themselves, while two confer temperature sensitivity to cells. When the mutant proteins are overproduced in wild-type cells, all of these six show a dominant negative effect on cell growth. The replacement by serine of the only cysteine residue present in Sar1p caused no significant change in the growth phenotype. These findings are not only important for analyzing the mechanism of the Sar1p action in yeast, but will also be very useful for studying the function of Sar1p counterparts in higher eukaryotes. Inhibition of GTP hydrolysis by Sar1p causes accumulation of vesicles that are a functional intermediate of the ER-to-Golgi transport in yeast. 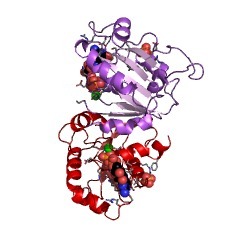 The SAR1 gene product (Sar1p), a 21-kD GTPase, is a key component of the ER-to-Golgi transport in the budding yeast. We previously reported that the in vitro reconstitution of protein transport from the ER to the Golgi was dependent on Sar1p and Sec12p (Oka, T., S. Nishikawa, and A. Nakano. 1991. J. Cell Biol. 114:671-679). 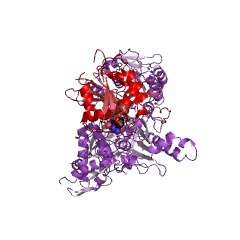 Sec12p is an integral membrane protein in the ER and is essential for the Sar1 function. In this paper, we show that Sar1p can remedy the temperature-sensitive defect of the sec12 mutant membranes, which is in the formation of ER-to-Golgi transport vesicles. The addition of Sar1p promotes vesicle formation from the ER irrespective of the GTP- or GTP gamma S-bound form, indicating that the active form of Sar1p but not the hydrolysis of GTP is required for this process. The inhibition of GTP hydrolysis blocks transport of vesicles to the Golgi and thus causes their accumulation. The accumulating vesicles, which carry Sar1p on them, can be separated from other membranes, and, after an appropriate wash that removes Sar1p, are capable of delivering the content to the Golgi when added back to fresh membranes. Thus we have established a new method for isolation of functional intermediate vesicles in the ER-to-Golgi transport. The sec23 mutant is defective in activation of Sar1 GTPase (Yoshihisa, T., C. Barlowe, and R. Schekman. 1993. Science (Wash. DC). 259:1466-1468). The membranes and cytosol from the sec23 mutant show only a partial defect in vesicle formation and this defect is also suppressed by the increase of Sar1p. Again GTP hydrolysis is not needed for the suppression of the defect in vesicle formation. Based on these results, we propose a model in which Sar1p in the GTP-bound form is required for the formation of transport vesicles from the ER and the GTP hydrolysis by Sar1p is essential for entering the next step of vesicular transport to the Golgi apparatus. A novel GTP-binding protein, Sar1p, is involved in transport from the endoplasmic reticulum to the Golgi apparatus. SAR1, a gene that has been isolated as a multicopy suppressor of the yeast ER-Golgi transport mutant sec12, encodes a novel GTP-binding protein. 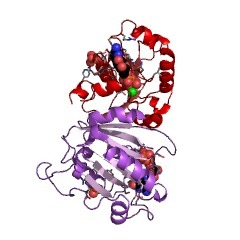 Its nucleotide sequence predicts a 21-kD polypeptide that contains amino acid sequences highly homologous to GTP-binding domains of many ras-related proteins. Gene disruption experiments show that SAR1 is essential for cell growth. To test its function further, SAR1 has been placed under control of the GAL1 promoter and introduced into a haploid cell that had its chromosomal SAR1 copy disrupted. This mutant grows normally in galactose medium but arrests growth 12-15 h after transfer to glucose medium. At the same time, mutant cells accumulate ER precursor forms of a secretory pheromone, alpha-mating factor, and a vacuolar enzyme, carboxypeptidase Y. We propose that Sec12p and Sarlp collaborate in directing ER-Golgi protein transport.